Hello Everyone! 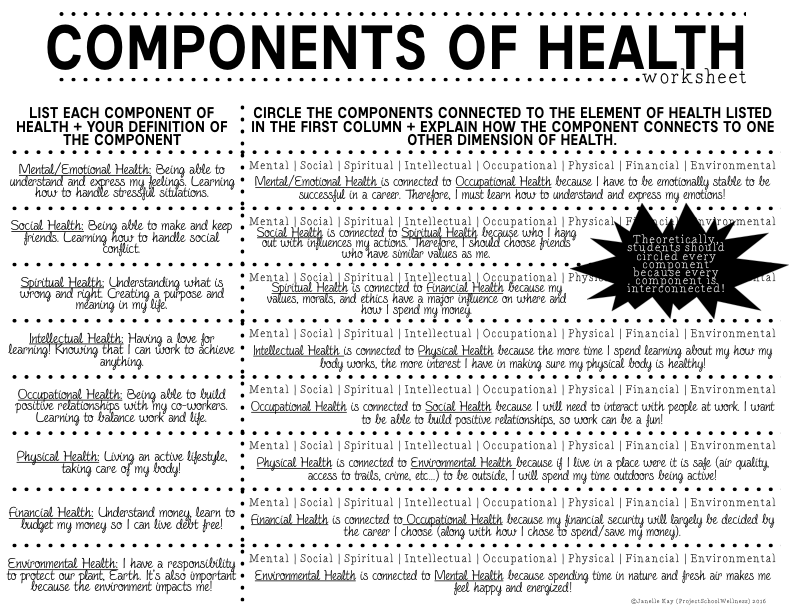 Today, I want to post part one of the Components of Health Lesson Plan series. 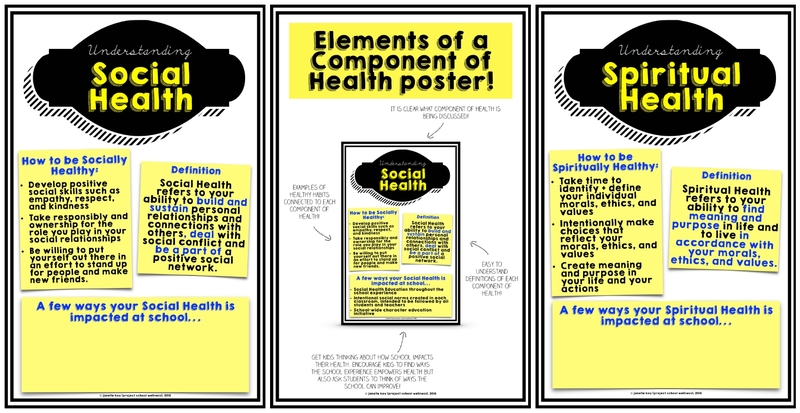 I successfully wrapped up this unit with my students last week and now it’s time to share:) The goal of this unit was for students to understand that health is multidimensional and that the elements of health are interconnected. 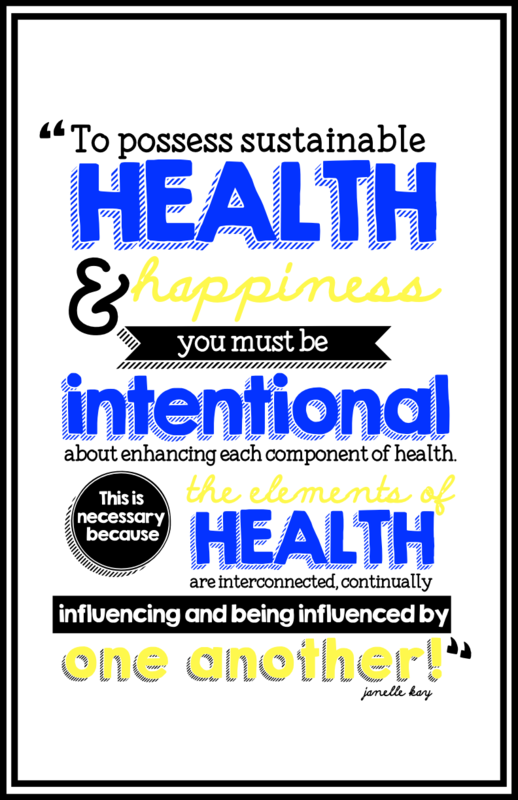 At the most basic level, I wanted students to understand that being healthy means so much more than eating a balanced diet and living an active lifestyle. If a multidimensional, interconnected approach to health is new to you, please take a few minutes and watch this quick video exploring the interconnected nature of health. Encouraging students to approach health through a new lens is no easy task. So to help make it more interesting and manageable I broke the unit into three parts: 1) Foster a basic understanding of each component of health; 2) Learn how each component connects to the other seven components; and 3) Showcase individual understanding through creative projects. This post is going to mostly focus on part 1 and a little bit on part 2. To teach my 7th and 8th students about the components of health, I set up eight learning stations around the classroom. Each station featured a poster (⇓⇓⇓) highlighting one component of health. For 6th grade, I projected the posters on the wall and we worked through each station as a class. As students progressed through the learning stations, they were expected to read the posters, discuss with their partners and take notes with the components of health note taking table. On this table, students were asked to write their personal definition of each component of health in the left column. Then, on the right side of the paper, they were suppose to determine which elements of health connect to the component highlighted at each station. I let the students progress through the stations at their own speed and found that most finished around the same time. If any groups finished early, they were to discuss the right column of the worksheet in greater detail. Once everyone was finished, we joined together as a class for a discussion focused on the interconnected nature of health. To end this 75 minute class period I gave students a formative assessment to check each student’s understanding. For my 6th graders, their assessment was to independently fill out the right side of the note taking table. For 7th and 8th graders, I gave them the worksheet shown below (⇓⇓⇓). 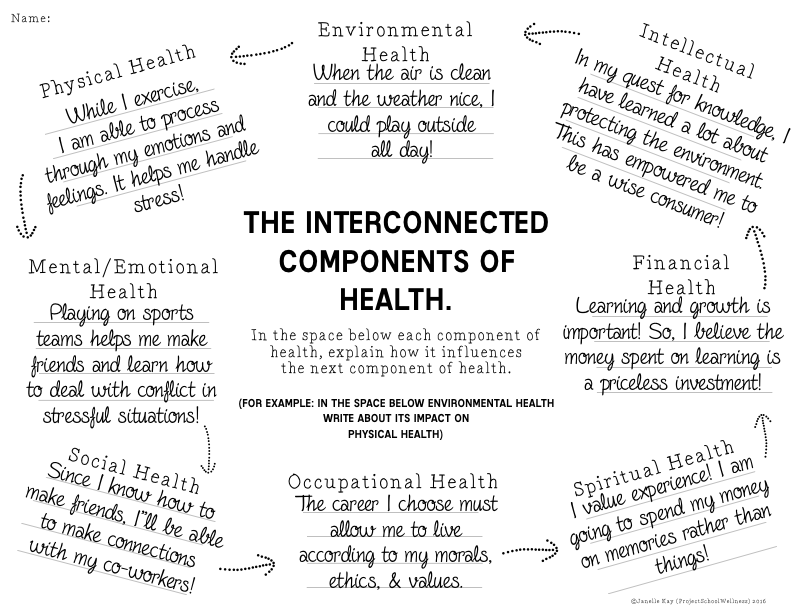 On this assessment, students were asked to show understanding of each component of health and the interconnected nature of health by listing connections between two different elements of health. My 7th and 8th graders did very well on this assessment, which showed me they were ready to move on to the next portion of the unit. However, as I looked through my 6th graders’ formative assessment it was clear that they had not fully grasped the concept of interconnected components of health. Therefore, they needed more instruction on this topic, their additional instruction was the Just Post-It Components of Health Activity (⇓⇓⇓), which will be highlighted in tomorrow’s post. Overall, I was super happy with the components of health learning stations activity. I absolutely love using activities that require students to take ownership of their learning. And with learning stations students have all of the tools needed to succeed, so success truly comes down to how hard they are willing to work!